A short break from the crap side of the sport, important to remember that regardless of what some clowns do, the best part of cycling is still to just get on a bike and ride. So here is an ode to the smallest piece of apparel I wear, but my favorite. I have various types of jerseys, shorts and even shoe covers, but nothing is quite as versatile as the skull cap. Yet I rarely see people use one. I got my first skull cap from RnH, the now defunct Canadian apparel brand that was big in the nineties. It was fleece, perfect to protect your head (especially your ears) from the cold. My second skull cap was from Mammut, pretty similar in design. They both had the same drawback. Their thickness meant that in the spring or fall, when the weather fluctuates and you sometimes ride with or without the skull cap, you need to adjust your helmet straps constantly. That problem diminished as I started to wear a skull cap even in warmer weather. If it didn’t protect against the cold, it would protect against the bugs and the sun. Especially when follicly challenged as I am, that’s a big thing. It’s funny to have a “helmet vent-shaped sun burn on your head once, but the fun wears off a lot quicker than the burn does. The only problem; It gets pretty hot under that cap. Now Castelli has solved both issues. First off, their winter skull cap is very thin, even though it is still fleeced. This means you can use it under your helmet without needing to lengthen your straps. It keeps you warm, including your ears, and you don’t really notice you’re wearing it, it’s that comfortable. This is what I have used for the past year, until I lost it a few months ago. Talking to Castelli about a replacement, I found out they also solved the second problem, that of the hotness in the summer. Next to the winter skull cap, they now also offer a summer skull cap. I’ve used the latter for two months now, and I love it. It’s thin and light, doesn’t cover your ears (like an elephant, I use my ears to cool down), it is very comfortable to wear and it offers sufficient protection against sun and bugs. It also holds on to sweat, and any sweat that is locked into that cap won’t run into your eyes. You can find more info about the summer skull cap here and about the winter skull cap here. 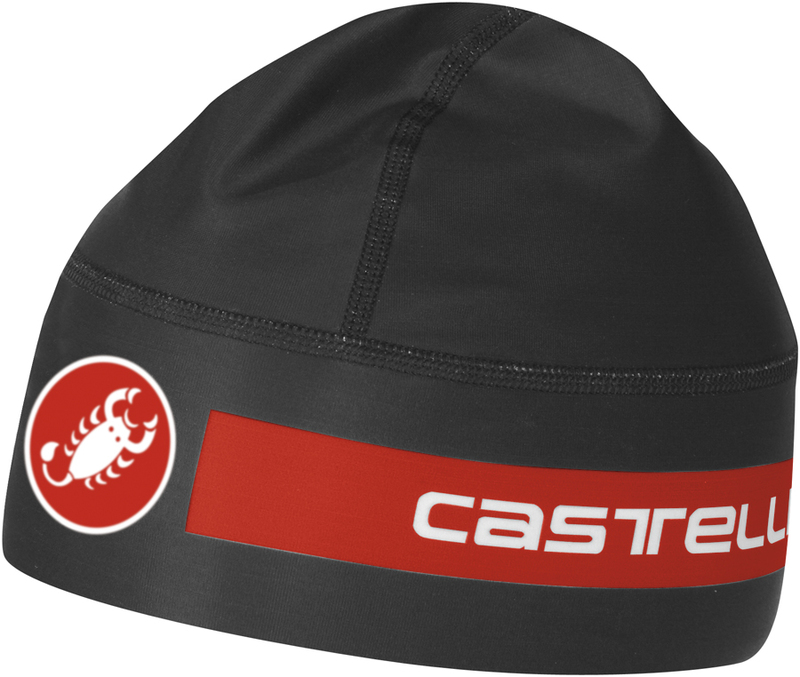 Disclosure: I do and have done some business with Castelli from time to time, though not enough to make me love a skull cap I don’t love! This entry was posted on	August 29, 2012 at 14:30	and is filed under bike equipment. In the same boat ….lacking in the hair department the skull cap is staple for wear for winter riding, had not seen the summer vesrion so will check it out, but normal cotton caps under the helmet have always sufficed ! Another follicly challenged rider here. I can get sun protection from sunscreen but the added bonus of bug protection sounds good. I understand that it holds on to the sweat but doesn’t it make you sweat more without the airflow directly on your head? I’m also follicly challenged and have been wearing an old-style cotton racing cap under my helmet in the summer. 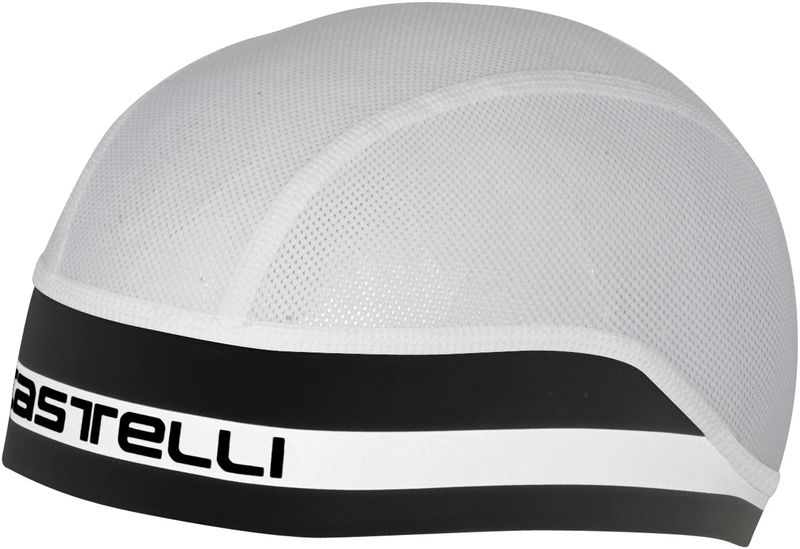 It works pretty well but that Castelli cap looks much more high-tech. Thanks for bringing it to our attention. I’m going out to buy one today. For the summer months, you could always have just gone with the Pantani “pirate” look! A $5 white bandana does the trick for me, as a gloriously hairy dude skullcaps are a bit uncomfortable. The cotton fabric absorb the sweat and when it turns grey well it’s time to wash ! For years I happily rode with a cloth cycling cap or a summer-weight coolmax ™ skullcap-ish thing, then for some reason on a short ride I went bareheaded — and found it a lot cooler. To combat the sunburn problem of the top vents I just put a piece of paper towelling into the helmet top before putting it on– works a treat, and there is still good cooling airflow around most of the head. I have a shaved head and experienced the sunburn-through-the-vent effect a couple of summers ago, after a longer than expected ride on a hotter-than-expected (38-degrees) day. Once she’d stopped laughing at me and telling me I looked like a toadstool from Super Mario World, my beloved went straight out and bought me a couple of large squares of very thin, very good quality cotton. Folded for cooler days or cut diagonally for summer (for a thinner layer) these home-made bandanas have been great. The material’s of natural fibres, so doesn’t actively provoke sweating, unlike many “technical” materials I’ve tried; it’s absorbent, but thin enough that the airflow dries it. Even better, it can be washed by hand as soon as I get back from a ride and it dries in five minutes in the sun. And the other unexpected advantage is that I’ve still not had to remove the pads from my helmet and wash them – they feel dry to the touch at the end of the ride. Assos makes great skull caps as well! As an alternative…. Thanks Gerard. I read your blog all the time. Was a nice surprise to see this today. I dont ride anymore without a skull cap. I have been using Underarmor caps for years. How do they compare if you know? I would like a thinner option if possible. Once you have headphones, sunglasses and chinstrap all fighting for real estate it becomes a bit of a pain. I really sweat though and cant stand it in my eyes. I think Gerard and you guys have way too much time on your hands. Where is Ralph Dunning now? RnH was great. Ralph has started a few other apparel brands since (825 Hockey, Dunning Golf and Dunning) and he now runs an agency called Acoustic Creative (www.acousticcreative.com).